• Creation of a logo for the Garden Club. • Worked hundreds of hours in the Park alone or with her husband Jim. and she has kept the rest of the Park Committee on track. Sheri has been our leader in turning the ravine into a true Park. marker that will be installed at the head of the trail. 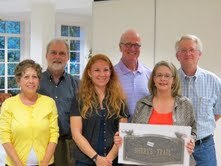 Thank you Sheri for the countless hours you have put into the park and improving our neighborhood! The park is beautiful and we enjoy taking walks through it regularly. All of your hard work has really made a difference. Bravo! Thank you for your effort and congratulations. I loved the neighborhood meeting last night — it was so meaningful and very special. Sheri, after many sleepless nights I know you have spent planning and thinking about the Park’s future potential, the Park as it is today is literally a dream come true. And it will only get better. Thank you so much for making it happen for all of us to enjoy! Very fitting. Sheri you are amazing. Glad the trail has become real. Great idea; start to finish??? I wanted to make sure that the question marks indicate the upkeep we all need to commit to. Congratulations, Sheri! A fitting tribute. Thanks to Sheri and all of the other neighbors who’ve made those trails a delight to walk through!